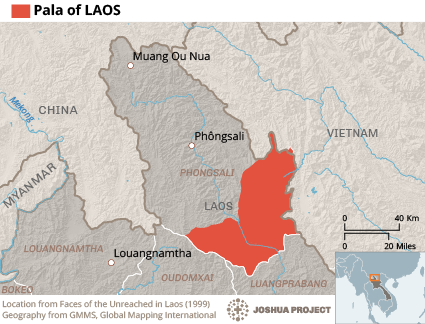 According to Laurent Chazee, 4,000 Pala people inhabit 26 villages in northern Laos. Fourteen Pala villages are located within the Mai District of Phongsali Province, with an additional 12 villages in Koua District. The Pala live in a mountainous area near the Oma, a group they share some cultural and linguistic similarities with. The Pala are an isolated group, living at an altitude of between 800-1500 meters (2,600-4,920 feet) above sea-level. The Pala are considered relatively closed to new ideas and development. They mostly trade with the Lao and the Khmu. On occasions they venture down to the market in Koua where they buy and barter for products they need. 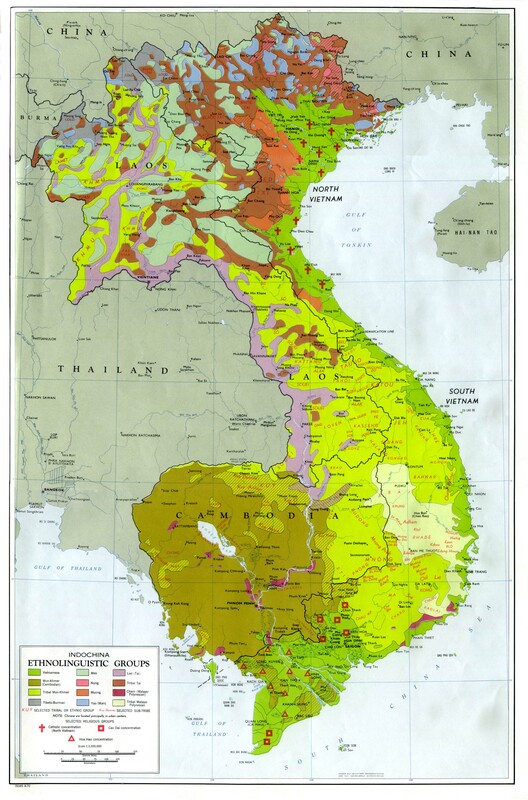 The Lao government does not count the Pala as a distinct ethnic group. It is probable they were officially counted as part of the Akha in the 1995 census, even though the Pala have a different autonym and language from other Akha groups in Laos. Pala women wear traditional clothing which is produced in their village. These days, they mostly wear their traditional clothes on festival days, or when they go to the market. Decorations of coins and aluminum are added to give a striking appearance. The women also adorn themselves with embroidered aprons, vests, trousers and turbans. Both men's and women's everyday clothing are made of simple blue indigo cloth. Animism and ancestor worship are the dominant religious beliefs among the Pala. Every home has a sacred ancestral altar, where rituals and offerings are made at appointed times. Numerous spirits and deities are also worshipped by the Pala. Every June, after the rice harvest has been planted, a ceremony called Tgelapeu is held to honor the spirits of the village and the harvest. Other religious ceremonies are held whenever there is a birth, death, or wedding among the Pala. A spirit-priest is called upon to officiate. He acts as a mediator between the Pala and the spirits, taking the people's requests and prayers to the realm of the spirits. The Pala are completely unreached by the Gospel. Few have ever heard of Jesus Christ. Possibly the only Christian community in southern Phongsali is among the Khmu. They may represent the best opportunity for the Pala to hear. 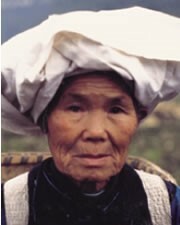 * Ask God to send Khmu Christians to share Christ with the Pala. Pray for smooth communication. * Pray the Holy Spirit would draw many Pala to Himself. * Pray the Lord would put a desire to seek the Truth in the hearts of many Pala people in Laos.View Pala in all countries. Location in Country: Phongsali and Luang Namtha provinces.